My over-the-knee boots paired with my skinnies and oversized sweaters have been my daily uniform as of late (no really, I’ve worn these boots I think everyday this week :/). It’s a no fuss look that totally possesses both form and function. Happy Friday, have a great weekend! Great boots and statement necklace. at least you’re bringing down you’re price-per-wear! You’re gorgeous! Love this outfit specially the color of the sweater. 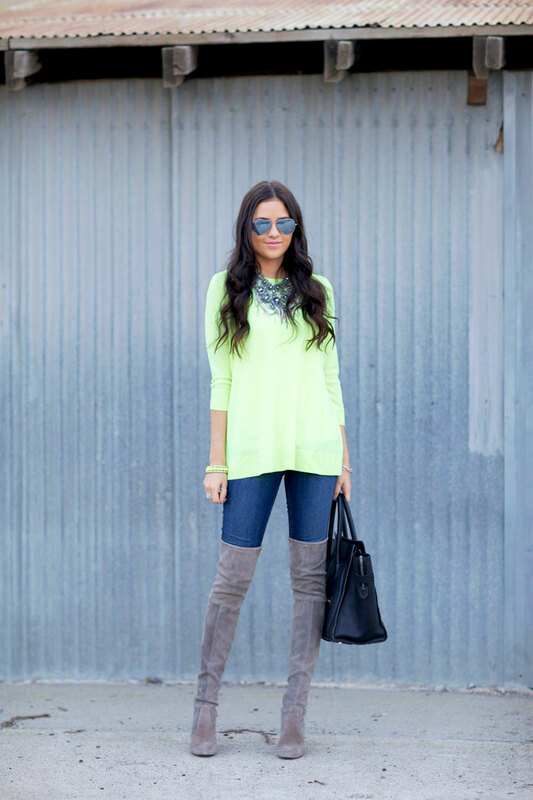 LOVE the neutral boots with the bright top! Such a fabulous combination! Love the combination, so put together yet effortless! I love everything about this outfit and wish I could raid your closet! LOVE those boots. I can see why you’ve worn them every day! Great look! I love that necklace! You dress these boots so well!! Sometimes I’m afraid that over-the-knee will look, how do I say… trashy. But you look amazing! I couldn’t agree with you more :) Love the boots on you!! Can I ask if they’re comfortable?! Wow Rach, these boots are too fab!!! what size are you wearing in the neon tunic? Can’t decide between small and medium. It looks presh! 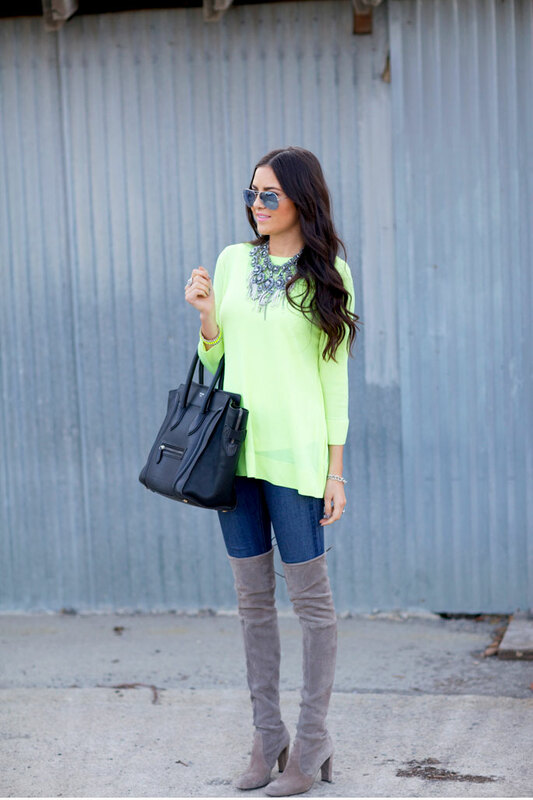 Love this bright color – paired with the boots it’s a perfect fresh winter look. I am ready for spring! I love the color of this sweater – stunning! Have a great weekend! It’s a stunning uniform. These boots are all that! I love the pop of neon. You always wear beautiful colors and it’s stunning! 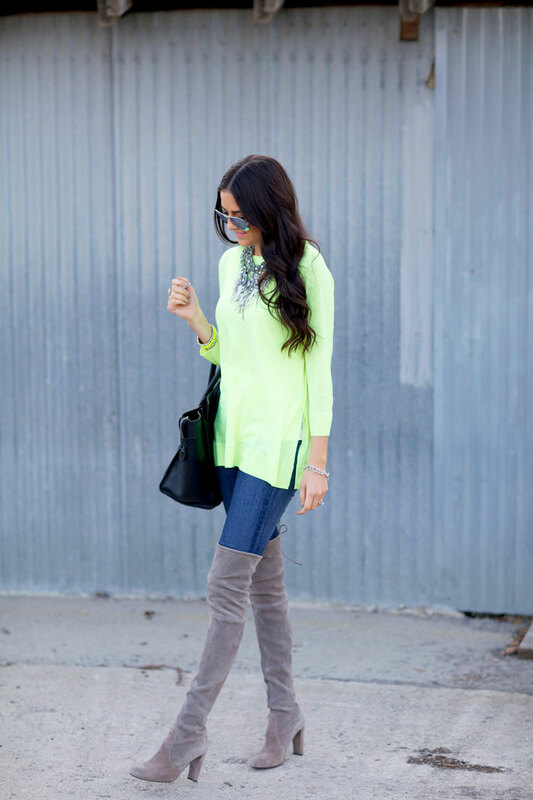 Love that pop of neon….and the combo with the grey boots is fab! Love love this look!! Those boots are so fab!!! I really like this colour on you!! I am REALLY REALLY digging this outfit!!! Love the neon. Love the look.. super cute! Just wanted to ask, I have these boots and I can see in your images that it yours have done the same as mine. The toe has changed colour and they now look two tone. Have you noticed this? If you have time please have a look at my latest post where you can see me wearing them and let me know your thoughts and if you have contacted SW regarding this and what they have said, I’m not getting any luck with them here in the UK. I am DYING for those boots! Absolutely stunning! Fantastic look. 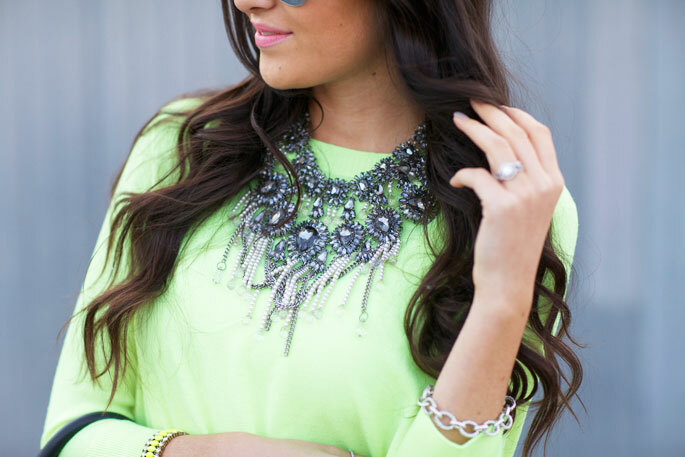 Loving that statement necklace paired together with the neon! Those boots are amazing! I love them! I love your over the knee boots. Neon colors really suit you as well! Love this look, Rach. Austin is so very casual, so looks like this become my uniform too! I might have to find my way to Stuart Weitzman…there’s one near my house :) Those boots make your legs look incredibly long! Love the boots over skinny jeans look! Your legs are looking extra long! I LOVE that neon green sweater…it’s one of my favorite colors right now! And that necklace is so fab too! Love every piece! The boots and the necklace are fabulous statements. Great uniform, Rach! Those boots make you look SO tall! Absolutely love this look! Boots are amazing! Fabulous look as always! I’m loving the fabric of these boots you are sporting! Wow, amazing style. Love the color combination – it just brightens up your mood all at once. Omg Stuart Weitzman makes the best high boots! They look really good on you! Those boots are amazing on you! So flattering – I definitely want to order a pair of those for myself! I love that neon top and that necklace is gorgeous! LOVE the colour of that sweater!!!! I love everything about this! And your hair looks amazing! Killer look! A great combo transitioning from winter into spring! Please follow our blog for fun and stylish posts! OMG!!!!! I LOVE the boots!!!!! !love love love!!!!! You look stunning! I love the combination and I absolutely love the boots! Love that sweater! I have some Sam Edelman OTK’s that are super similar to those and I just love them. Love the color of yours though! I keep on saying this but you seriously have killer legs! Love this outfit, that necklace is stunning! Those boots are killer! I love how they look with the neon sweater, beautiful. love the accessories and those boots are gorgeous! I love that vibrant top and your gorgeous statement necklace and I am swooning over your boots. By the way, I have a pretty awesome giveaway going on. Check it out. The link for the Stuart Weitzmans links to the Selma Michael Kors bag… I would like to get the boots but can’t find them online… can you repost the link to them please? Love this outfit! 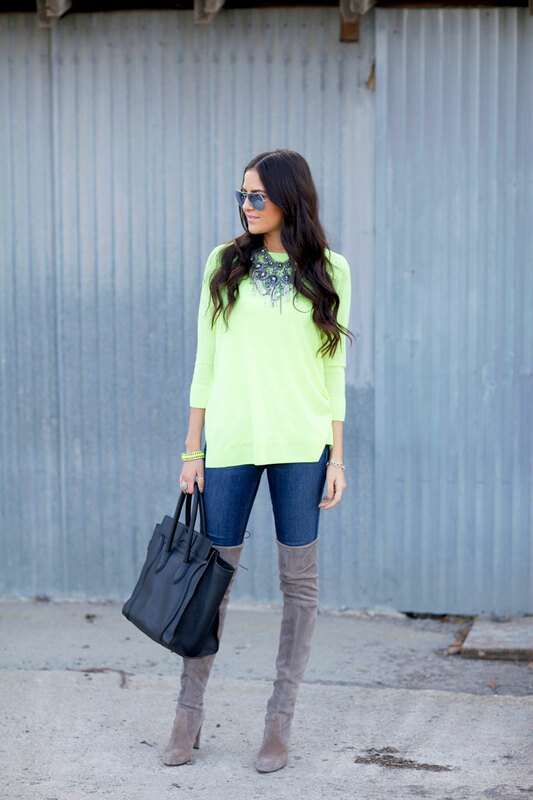 Those boots are fabulous and I love that neon top – so pretty! Lovely outfit! Love the colour of the shirt! You look stunning in those overknees. I really like their color and texture, they really look like you can wear them every day. Rach, I feel ya. Over-the-knee boots have been my go-to this winter. Those stuart weitzman’s are stunning! I love mine! neon must be in again! Amazing look! I love every part of it, especially the sweater! GORGEOUS boots! That outfit is just stunning! I love how you elevated this casual look with a killer necklace and amazing footwear. Love love your entire outfit- especially the boots!! Perfect Outfit. Love the color of your sweater and this stunning necklace. I love the statement necklaces from Zara. You look so good in this bright color! In love with your boots!!! Thank you! Yes I love these boots!